Innovative Steel Mounts are CNC Machined from Steel with high quality welds. Innovative Steel Mounts are a great entry level kit for practically any swap. 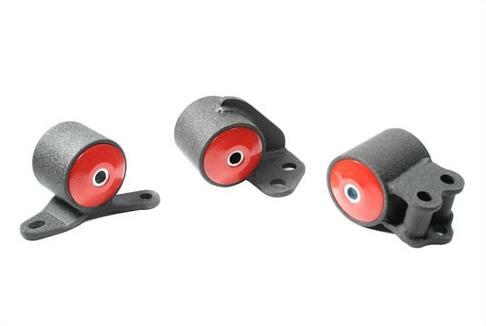 60A Red Bushings – Up to 250HP – These bushings are recommended for street cars. Most of kits come standard with these bushings. 60A bushings provide the least amount of vibration transfered from the engine to the chassis. This equates to a more comfortable everyday ride. 75A Black Bushings – Up to 500HP – These bushings come standard on all H/F Series engines. These engines weigh more and need a stronger bushing. 75A is recommended for street and track vehicles that make more than average horsepower. This rating of bushing is also for those that would like a stiffer feel and less engine flex. 85A Grey Bushings – 500+HP – Designed specifically for race cars or drivers that seek a solid engine mount kit.